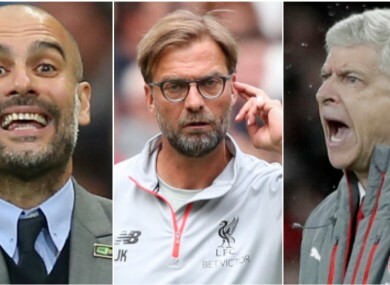 Manchester City manager Pep Guardiola (left), Liverpool boss Jurgen Klopp and Arsenal chief Arsene Wenger. IT’S QUITE UNLIKELY to occur but there is a chance that this season’s Premier League spots for the Champions League could be decided by a play-off. Third, fourth and fifth positions will be split between Manchester City, Liverpool and Arsenal, that much is certain. But with all three sides closely matched in terms of points, goal difference and goals scored, a play-off for third or fourth isn’t beyond the realms of possibility. Head-to-head records don’t count so if the above three variables finish up even between two of the three sides, a play-off game at a neutral venue will take place to decide who finishes where. With one round of Premier League matches to play, the easiest way to get your head around it is first of all by seeing how things currently stand. Saturday’s fixtures involving the above teams are: Watford v Manchester City, Liverpool v Middlesbrough and Arsenal v Everton and depending on how those results go there are three possible play-off scenarios, where two teams would finish tied on points, goal difference and goals scored. A play-off for the fourth and final Champions League spot could eventualise between Liverpool and Arsenal, while Manchester City could face Liverpool in a play-off for third place, the winner of which would advance directly to the main draw of the premier European competition, the loser heading for the qualifying route. To add to the confusion, City could also face Arsenal in a Champions League play-off for third or fourth spot, depending on how Liverpool get on against Boro. For Liverpool and Man City to finish level on all fronts, Jurgen Klopp’s side need to win convincingly against relegated Boro at Anfield, while Guardiola’s charges would need a high score draw at Watford. Liverpool need to win by three goals, and Man City would need to match the number of goals scored by the Reds. For example — Liverpool 3 Middlebrough 0 and Watford 3 Man City 3 or Liverpool 4 Middlesbrough 1 and Watford 4 Man City 4 etc. In this scenario — win, lose or draw — Arsenal would finish fifth. If Arsenal grab a score draw at home to Everton and Liverpool lose to Middlesbrough by two goals (scoring once less than the Gunners) they will find themselves level in fourth spot; tied on points, goal difference and goals scored. Man City would finish third. So, Arsenal 1 Everton 1 and Liverpool 0 Middlebrough 2; or Arsenal 2 Everton 2 and Liverpool 1 Middlebrough 3 would level things out between the sides, and so on. Clear as mud? Good, because the permutations aren’t done yet. Manchester City and Arsenal can finish level on points this weekend if Guardiola’s side lose at Watford and the Gunners beat Everton at the Emirates. However, if they are to finish level on goal difference and goals scored City will need to lose to the Hornets by four goals, and Arsenal will need to beat Everton by one goal, scoring just once more than City do. For example: Watford 4 Manchester City 0 and Arsenal 1 Everton 0 would do it, as would Watford 5 Manchester City 1 and Arsenal 2 Everton 1. If Arsenal and City were to finish level on all the variables, Liverpool’s result could dictate whether their play-off would be for third or fourth place. A Reds loss, Arsenal win and City defeat would see Liverpool drop down to fifth, meaning a potential play-off would decide third and fourth. However, if Arsenal and City were to finish the season deadlocked and Liverpool were to win, the Gunners and the Sky Blues would be battling it out for the fourth and final Champions League spot. Email “Explained: What needs to happen for Champions League spots to be decided by a play-off”. Feedback on “Explained: What needs to happen for Champions League spots to be decided by a play-off”.